Since Montana became a U.S. state in 1889, it has sent congressional delegations to the United States Senate and the United States House of Representatives. Each state elects two senators to serve for six years. Before the Seventeenth Amendment took effect in 1913, senators were elected by the Montana State Legislature. Members of the House of Representatives are elected to two-year terms, one from Montana's at-large congressional district. Before becoming a state, the Territory of Montana elected a non-voting delegate at-large to Congress from 1864 to 1889. A total of 54 people have served either the Territory or State of Montana: 17 in the Senate, 32 in the House, and five in both houses. 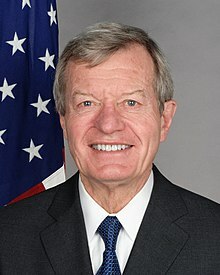 The longest-serving senator is Max Baucus, in office from 1978 to 2014. The longest-serving representative is Pat Williams, in office for 18 years from 1979 to 1997. One woman has been a member of Montana's congressional delegation, Jeannette Rankin, as a representative. She was the first woman in the United States Congress. Each state elects two senators by statewide popular vote every six years. The terms of the two senators are staggered so that they are not elected in the same year. Montana's senators are elected in the years from classes I and II. Senators were originally chosen by the Montana House of Representatives until the Seventeenth Amendment came into force in 1913. There have been twenty-two senators elected from Montana, of whom fourteen have been Democrats and eight have been Republicans. Montana's current senators are Democratic Jon Tester, in office since 2007, and Steve Daines, in office since 2015. Tester was re-elected in 2012 with 48.58% of the vote, and Daines was elected in 2014 with 57.9% of the vote. The Territory of Montana was an organized incorporated territory of the United States formed on May 26, 1864. The territory initially consisted of present-day Montana. The boundaries of the territory did not change during its existence. The territorial delegates were elected to two-year terms. 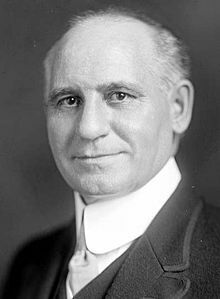 Delegates were allowed to serve on committees, debate, and submit legislation, but were not permitted to vote on bills. Delegates only served in the House of Representatives as there was no representation in the Senate until Montana became a state. Members of the House of Representatives are elected every two years by popular vote within a congressional district. Montana currently has an at-large congressional district that represent the entire state. Every ten years, the number of congressional districts is reapportioned based on the state's population as determined by the United States Census; Montana had had two districts from 1913 to 1993. There have been 34 people, including just one woman, who have served as representatives from Montana: 15 Democrats, 18 Republicans and 1 Populist. Greg Gianforte is the current officeholder. 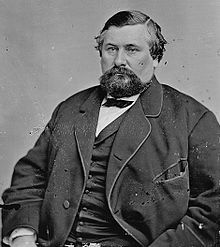 ^ Seat was vacant due to failure of legislature to elect a senator by the beginning of the congress. ^ Lee Mantle was appointed to fill the vacancy, but was not seated; he was later elected to the term. ^ Elected to fill the vacancy caused by the previous representative being elected to the next term, but vacating the seat before the term began. ^ a b c Was appointed to the office, and was later replaced by an elected successor. As of April 2018[update], there are seven former members of the U.S. House of Representatives from the U.S. State of Montana who are currently living at this time. As of April 2018[update], there are two former U.S. Senators from the U.S. State of Montana who are currently living at this time, both from Class 2. ^ "2012 Statewide General Election Canvass, United States Senator" (PDF). State of Montana. Archived from the original (PDF) on 2016-07-05. ^ "2014 Statewide General Election Canvass, United States Senator" (PDF). State of Montana. ^ "Delegates to the U.S. Congress: History and Current Status" (PDF). Congressional Research Service. Retrieved January 17, 2011. ^ "Decennial Census". American FactFinder. Archived from the original on June 11, 2010. Retrieved May 13, 2010. This page was last edited on 22 March 2019, at 19:50 (UTC).